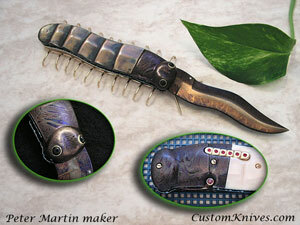 Here we go again with one of Peter Martin's award winning "bug knives". This knife won the "Best Fantasy Art Knife" at the recent 2007 Badger show. This is a double action automatic. The Centipede has a Damascus head with Onyx eyes and Gold settings. The upper body is lost wax cast Shokudo (80% copper and 20% Gold). The lower body is carved Walrus Ivory.14K Gold rocker bar with 6 synthetic rubies. The 4 1/16" blade is 3 bar composite Damascus with a 14K Gold thumb stud. The stand and screws are solid 14K Gold. The anodized liners are file worked on both sides. The back spacer/spring is also Damascus and is inlayed with 14K Gold. Ethical practices and the concerns of my customers are given first priority. If you are not satisfied with your knife, return it within 5 days in the same condition as you received it for a full refund, less shipping. Shipping and insurance is $15.00 in the USA.